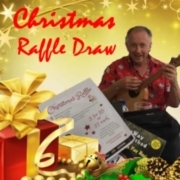 The Christmas Hamper Raffle was drawn at Jingle BUMS at Coorparoo on 5 Dec 2018. And the very delighted winner was … Madonna King! 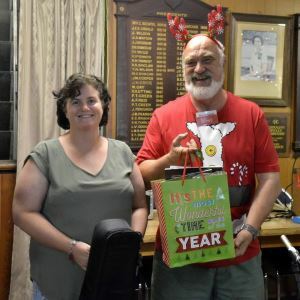 Max presents the Christmas raffle prize to Madonna King, Jingle BUMS 2018. The Hamper contained everything you need for a ukin’ great holiday — a Makala tenor ukulele, a quality aNueNue gig bag, an electronic tuner, ukulele strap, and 101 Tips for ukulele Players that Pros Know and Use, a bottle of Yellow Glen Sparkling Wine, a Christmas cake & chocolates. Congratulations, Madonna. Thank you to all our members and friends who supported the raffle. 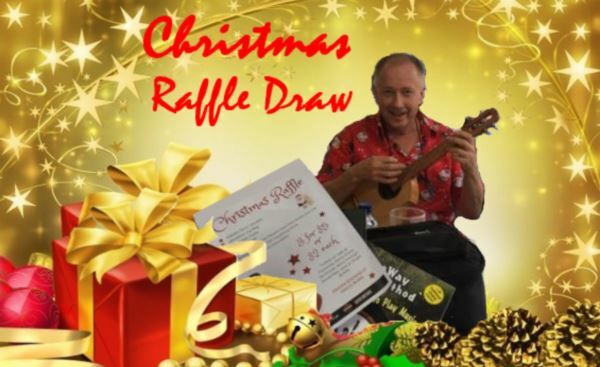 And a very big thank you to our raffle sponsors, Guitar Brothers at Red Hill.